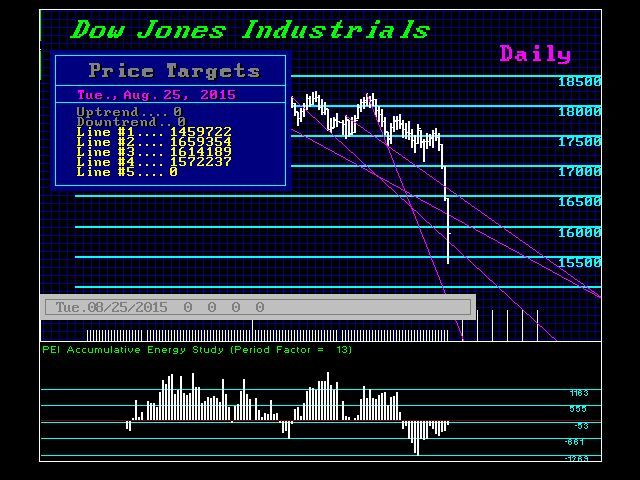 In the Dow, we can see that Energy bottomed out so we have a counter-trend at work right now. We do have a pair of Daily Bearish Reversals at 14769. We continue to see the prospects that today will perhaps remain as the lowest closing. Nonetheless, a new intraday low is possible given that we may yet see lower lows in Shanghai. Because the TV and pundits are blaming China for new lows, today will have some impact in the West. This correlation is not on track so it appears to be more of a desperate attempt to simply explain that capital was withdrawing since May where we also saw a turn in long-term debt.